Puerto Morelos Blog: REGISTER! 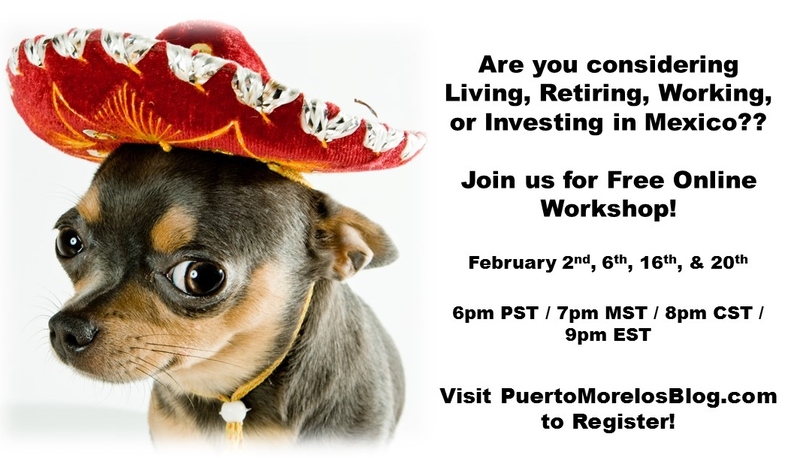 Online Workshop About Living/Retiring/Investing in Mexico!! REGISTER! Online Workshop About Living/Retiring/Investing in Mexico!! I field emails every day from people interested in the buying process in Mexico. Others, have lots of questions about general living (visas, cars, bank accounts, medical facilities, etc.) to consider before they can even think about investing. Here's your chance to pick my brain about any questions that you have! I will be holding FREE online workshops throughout the month of February! I'll do my best to answer any questions you bring along! Amber Pierce is a Federally Certified AMPI Realtor in Mexico and has been living in Puerto Morelos full time since 2004. She and her husband have lived, traveled, worked, schooled their kids, opened business, constructed/remodeled both commercial and residential buildings, been hospitalized -- you name it! Amber is a Federally Certified AMPI Realtor in Mexico and has been living in Puerto Morelos full time since 2004. She and her husband have lived, traveled, worked, schooled their kids, opened business, constructed/remodeled both commercial and residential buildings, been hospitalized -- you name it!